Marianne Straub was born in the village of Amriswil, Switzerland, where her father was a textile merchant. Straub went on to study Art at the Kunstgewerbeschule in Zürich where she devoted her second and third years at the college to hand weaving and textiles. Determined to master her craft, in 1932 Straub moved to the textile town of Bradford, England, and began studying her trade at the Bradford Technical College. After finishing her course, she was invited to work at Ethel Mairet’s Gospels studio at Ditchling where she further developed her hand loom techniques. By the mid 1930s Straub was working as a consultant designer for the Welsh milling industry where she learnt about mass production of textiles. In 1937 she joined the firm of Helios as head designer where she developed a range of woven and printed fabrics based on her own designs, before moving to the firm of Warners based in Braintree, Essex, in 1950. Through out the 1950s Straub was closely associated with the north Essex village of Great Bardfield, which became famous for its small community of talented artists, amongst them Edward Bawden. Organising a series of large “open house” exhibitions the Great Bardfield Artists attracted national press attention and thousands of visitors to the remote village during the summer exhibitions of 1954, 1955 and 1958. 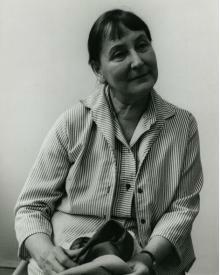 On her retirement from Warners in 1971, Straub left Great Bardfield and moved to Cambridge. As well as her design work, Straub was also an important textile teacher, having begun teaching at the Central School of Art, London in 1956. She later taught at Hornsey College of Art before moving on to the Royal College of Art, both in London. Straub wrote a book entitled Hand Weaving and Cloth Design, Viking 1977, and in 1972 was awarded the distinction Royal Designer for Industry (RDI).